Andrew T. Peebles is an associate and member of the Estate Planning Practice Group of Carnahan, Evans, Cantwell, & Brown, P.C. Mr. Peebles’ practice involves interpersonal communication with clients aimed at understanding their unique estate planning needs and objectives, and the preparation of various estate planning documents, including simple and complex trusts, wills, powers of attorney, premarital agreements, and business documents to accurately reflect those needs. Mr. Peebles also assists clients in the administration and distribution of the estates and trusts of recently deceased loved ones. 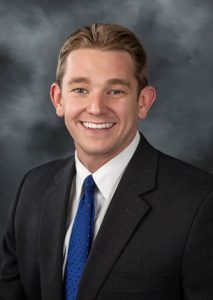 Mr. Peebles earned his Juris Doctor from the University of Missouri School of Law in May of 2015, graduating with a concentration in Estate Planning and Taxation. Mr. Peebles was awarded the 2015 Michelle Arnopol Cecil Award for Excellence in Taxation, and held numerous leadership positions during law school, including membership on the executive board of the Phi Alpha Delta legal fraternity. Mr. Peebles was a member of the Missouri Law Review editorial board from 2013-2015, and is the author of two published articles in the Missouri Law Review. He received his bachelor’s degree from the University of Missouri in 2011. Mr. Peebles enjoys giving back to his community by donating a significant amount of his time to various civic and charitable organizations, including serving as a Big Brother for Big Brothers Big Sisters of the Ozarks, assisting the Drew Lewis Foundation at the Fairbanks as a pro bono legal advisor, and serving as a member of the Great Futures Committee and a Youth of the Month judge for the Boys and Girls Clubs of Springfield. Mr. Peebles is a member of the Springfield Metropolitan Bar Association (Probate and Trust Committee), the Missouri Bar Association (Probate and Trust Committee), the American Bar Association (Real Property, Probate, and Trust Law section), and the Springfield Area Chamber of Commerce. Mr. Peebles also serves on the Board of Directors for the Rotaract Club of Springfield, Big Brothers Big Sisters of the Ozarks, and the Greene County Estate Planning Council. He is a proud member of Leadership Springfield, Signature Class 36.